This article was originally published on the website of Ohio State's College of Food, Agricultural, and Environmental Sciences. Editor: Brent Sohngen will discuss some of these findings as a panelist in a Sept. 30 webinar from noon to 1 p.m. For more information on the webinar, see go.osu.edu/algaewebinar. To connect to the webinar (free), go to carmenconnect.osu.edu/waterpollution. COLUMBUS, Ohio -- While agricultural scientists, policymakers and farmers are investigating ways to reduce the risk of severe algal blooms that stem from phosphorus, an Ohio State University environmental economist suggests an economic response could be the most cost-effective one. Imposing a 25 percent tax on phosphorus, used as a fertilizer primarily on corn, could reduce soluble phosphorus concentrations in the watershed by about 8 percent, according to an analysis led by Brent Sohngen, professor in Ohio State’s Department of Agricultural, Environmental and Development Economics. The department is part of the College of Food, Agricultural, and Environmental Sciences. “I don’t want to suggest that a tax on phosphorus could solve everything,” Sohngen said. “There’s no silver bullet, and the issues are complex. “Still, when we look at the data, we can’t detect any effect on water quality from the money spent on encouraging farmers to adopt conservation and no-till practices. Sohngen has studied the economics of conservation programs and nonpoint-source pollution, or pollution from diffuse sources such as farmland, since he started his career at Ohio State in 1996. Sohngen also has appointments with the college’s research and outreach arms, the Ohio Agricultural Research and Development Center and Ohio State University Extension, and he leads Ohio State’s Environmental Policy Initiative. In this research, Sohngen led teams to examine decades of daily water quality observations by the National Center for Water Quality Research at northwest Ohio’s Heidelberg University and study how different factors may have affected water quality. The water quality analysis differentiated between soluble phosphorus and attached phosphorus: Soluble phosphorus is more responsible for the toxic algal blooms in recent years and is associated with recently applied fertilizer, Sohngen said. Attached phosphorus is attached to soil particles and is related to the history of fertilizer applications on land over 60 or more years. The researchers examined weather patterns, including rainfall and water flows through the watersheds; policy considerations, including the impact of conservation programs; and economic factors, such as corn prices and prices of phosphorus fertilizer. Sohngen said water flows appear to have had a significant effect on soluble phosphorus levels in the watershed, and the overall flow in northwest Ohio streams increased in 1995-2010 over the previous 15-year period, 1980-1995. Data from weather stations also seems to indicate that there have been more large rainfall events in the past 15 years than previously, and these may also have increased soluble phosphorus in the water. Surprisingly, Sohngen couldn’t find an association between water quality and conservation tillage practices, which farmers have been encouraged to adopt for decades as a way to reduce erosion and improve both water and soil quality. Conservation tillage, including no-till practices, do have other benefits, Sohngen said, but according to his analysis, reducing the level of soluble phosphorus in the watershed doesn’t appear to be one of them. Improvements in water quality in the 1980s and 1990s that were thought to be a result of conservation practices may simply have been due to lower water flows during that period, Sohngen said. Higher prices, both for corn and for phosphorus itself, appear to have the largest impact on water quality, Sohngen said. “When corn prices increase, farmers plant more corn,” Sohngen said. 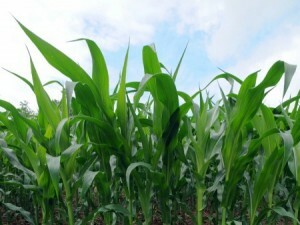 Although farmers apply more phosphorus to corn than to other crops, corn uses more phosphorus, too, thus reducing the overall amount that seeps into the watershed. Not surprisingly, Sohngen found even more of an effect on water quality as the cost of phosphorus has increased. Sohngen believes a two-pronged approach could be the most beneficial to the watershed: Encouraging more corn to be planted while at the same time discouraging farmers from applying phosphorus. “There’s an enormous pool of phosphorus just sitting in soils in northwest Ohio because we’ve overapplied it over the years,” Sohngen said. Since corn is such an effective user of phosphorus, encouraging more corn to be planted in the region could be helpful in using up those stores. But at the same time, less phosphorus needs to be applied, and taxing phosphorus “looks like it’s the cheapest way to solve the problem,” Sohngen said. While Sohngen admits that imposing such a tax on phosphorus fertilizer is an idea farmers would understandably resist, he suggests they may prefer it over possible stringent regulations on phosphorus use. “A tax is less invasive, and farmers would still have a choice,” he said. “They can pay the tax and apply as much phosphorus as they want, or not.